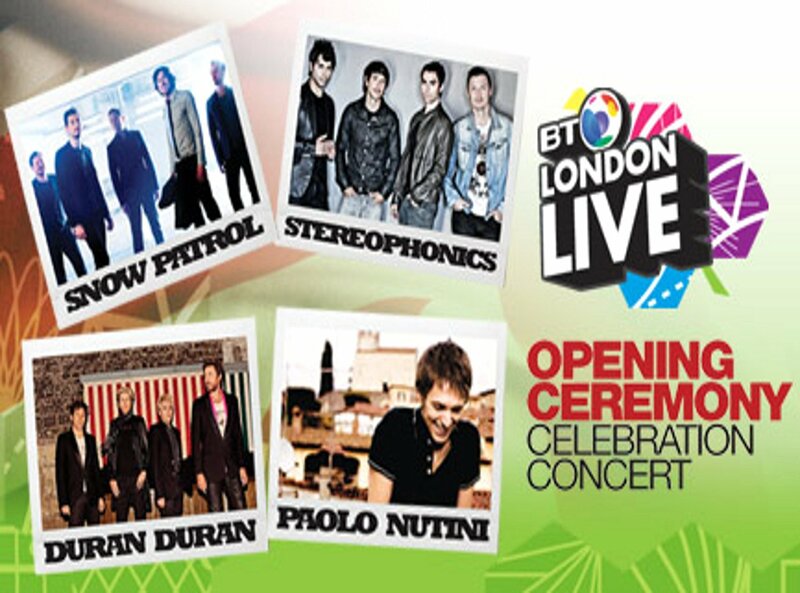 Duran Duran, Snow Patrol, Stereophonics and Paolo Nutini are celebrating the start of London Olympic Games at a special concert in Hyde Park this evening. The show coincides with the opening ceremony, which will be shown on big screens in the park. Scottish singer-songwriter Paolo Nutini took to the stage to loud cheers to open the show in front of 50,000 fans. Each of the four acts on the bill was selected to represent the different countries of the UK. Snow Patrol, representing Northern Ireland, will close the London concert. “It’s the only thing I’ll ever represent Northern Ireland at,” said frontman Gary Lightbody. “We were asked to represent our country, we’re never going to say no to that,” he added. Fellow headline act Duran Duran will perform second on the bill, representing England. Paolo Nutini, who performed hits such as Jenny Don’t Be Hasty, said it was “an honour” to be involved. “To go fly the flag for your country makes it even sweeter,” he added. Welsh rockers Stereophonics played four small warm-up shows around the UK this week in preparation for their set, following the big screen coverage of the opening ceremony. Meanwhile, the crowd of around 80,000 in the Olympic Stadium will include Queen Elizabeth II and a host of dignitaries and celebrities. Masterminded by Oscar-winner Danny Boyle, the £27 million ($43 million) extravaganza features a cast of 15,000 volunteers and is said to be a quirky take on British life. Westminster Council has extended Hyde Park’s curfew until 01:00 BST for what they called an “exceptional evening”, which is timed to run around the opening ceremony. Earlier this month organizers of a Bruce Springsteen concert pulled the plug on the power when his show over-ran. Westminster Council has confirmed that the gig to coincide with the closing ceremony on 12 August, headlined by Blur, will also have the same curfew.